And although it is a joyful time for our family, the holidays may not be an easy time for everyone. It’s important to reach out to others to learn how you can help. During this Season for Giving, we encourage you to reach out to one of the many local organizations that help others in our community. This Christmas we have partnered with South County Outreach in Orange County who helped us adopt the Badrak family. 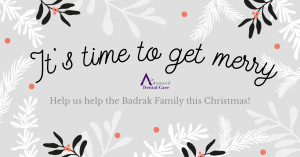 We would love your support in helping to make the Badrak family have the most spectacular Christmas possible this year. Clothing, gift cards, gift certificates, toiletries, home and kitchen items, and other Christmas gifts for the family are greatly appreciated! Please bring items for the family to our Costa Mesa dental office located at 3033 Bristol St. Ste. AA, Costa Mesa, CA 92626 by 5:00pm on Friday, December 14th. New and existing patients will receive a $20 account credit for any donation! For more information, please call us at (714) 424-9099 or email us at info@mycostamesadentist.com.